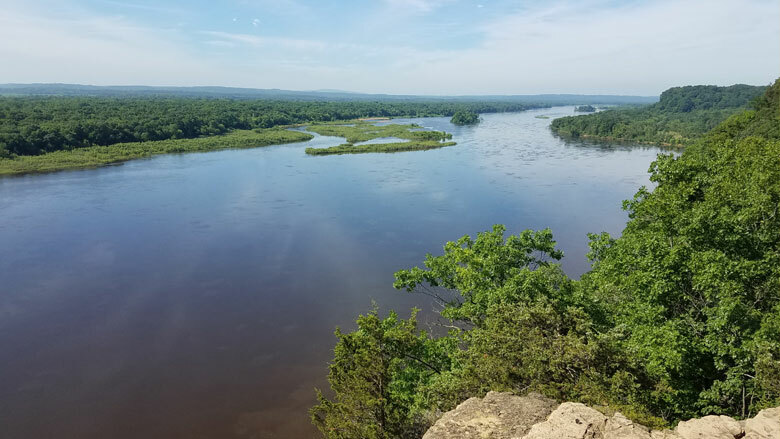 The view down the Wisconsin River from Cactus Bluff in Ferry Bluff State Natural Area. Millions of years ago this valley was carved to a depth of over 600 feet by an ancient river. The last major glaciation deposited as much as 300 feet of sand and gravel, resulting in the broad floodplain and terraces that characterize the Lower Wisconsin River valley today. Photo by Eric Carson. People tend to see a river as an immutable part of the landscape. We notice the changes that happen on a monthly and seasonal basis: the effects of spring snowmelt and summer drought and the rise and fall of intermittent floods. But we generally accept the notion that where a river flows at this moment is where it flowed in the past. If we look a little deeper, however, we see evidence of rivers responding to changes in land and water uses, even changes in climate. For instance, compare a photograph of a certain stretch of a river taken in the late-1800s with one taken today—they often look very different. There are parts of Wisconsin that feature half-buried fence posts and other kinds of evidence of sediment flushed from fields during the early decades of agriculture and deposited onto flood plains. Fueled by global climate change, the heavy rains of 2008 led to flooding that drained Lake Delton and altered the landscape of 31 of Wisconsin’s 72 counties, causing over $763 million in damages. When we look back in time and think about a river the way a geologist does, we begin to see that rivers are actually quite mobile across the landscape. Geologists have long understood that, given enough time, rivers can actually migrate. North America is dotted with places where rivers have changed course, abandoned established valleys to form new ones, or even reversed the direction of flow. As long ago as the late 19th century, geologists documented that the Ohio River, which today flows southwest out the Appalachians to its confluence with the Mississippi River at the southern tip of Illinois, was formed perhaps a million years ago by redirecting and integrating several rivers that formerly flowed northward toward the Great Lakes lowland. To study such events and processes of the ancient earth, geologists must turn the scientific method on its head. Based on a clear progression that emphasizes the reproducibility of experiments, the scientific method is quickly challenged when exploring events that happened in the distant past and at a monumental scale. A professor I knew as a graduate student was fond of saying that geology is not about conducting experiments, but, rather, collecting data to help understand what the experiment had been. This is the framework in which I learned to do science, from the time I was an undergraduate geology student until I became a research scientist. However, the past few years of studying the history of the Wisconsin River has been an exception to the way I was taught to adapt the scientific method to the realities of our peculiar science. Even though geologists understand a great deal about the most recent glacial advance that covered about half of Wisconsin some 24,000 years go, we have much to learn about the series of massive glaciations that happened here and across North America over the last 2.5 million years. The Wisconsin River has been deeply affected by all of this glacial activity. The river originates in Lac Vieux Desert in northernmost Wisconsin on the border with Michigan and flows across glacial deposits from the last Ice Age. One of the youngest landscapes in Wisconsin, the Northern Highlands formed as massive blocks of glacial ice, left behind and buried in sediment, finally melted—hundreds or perhaps thousands of years after the end of the Ice Age. The result is a chaotic landscape, pocked with kettle lakes and detritus from the last ice sheet, and the Wisconsin River wanders across it. North of the town of Merrill, the Wisconsin River flows along channels carved into igneous and metamorphic rocks that formed over a billion years ago. Near Stevens Point, it enters the Central Sand Plain, which was the floor of a massive, glacier-fed Lake Wisconsin that pooled at the edge of the ice sheet some 20,000 years ago. At Wisconsin Dells, the river flows through cataracts carved into the sandstone over the course of about a week by the catastrophic draining of glacial Lake Wisconsin some 17,400 years ago. The Wisconsin River then wraps around the eastern end of the ancient Baraboo Hills, and finally runs westward through the Driftless Area to its confluence with the Mississippi River. It is this final reach across the Driftless Area, a stretch known as the Lower Wisconsin River, that provides clues for understanding the radical changes that have occurred to the Wisconsin River and other rivers in the Midwest over the past several million years. The rivers that flow across the central portions of North America are defined by a series of surfaces that slope so gently as to be imperceptible to the human eye, on the order of ten or so centimeters per kilometer (a little over six inches per mile). The Lower Wisconsin River is no different. It features a deeply scoured bedrock valley that was filled by sand and gravel during the last glaciation. Beneath this sand and gravel, the buried bedrock floor of the valley slopes to the west: an absolute indication that it was carved by westward-flowing water. The floodplain and the river itself also slope gently westward. Along the steep walls of the ancient river valley, which is in some areas miles away from the river we know today, stand several sand-and-gravel terraces. These terraces represent remnant floodplains from when huge volumes of sediment-laden water emerging from the ice sheet also flowed west. Yet the Lower Wisconsin River contains an anomaly: preserved in three discrete pieces along the valley is a higher and therefore older terrace than the sand-and-gravel ones deposited by flooding during the last Ice Age. Carved into the bedrock by flowing water and covered by a mélange of unconsolidated sediments—river sand, lake clay and silt, landslide and slopewash sediment, windblown sand—this terrace represents the ancient floor of the valley from a time long before it had been scoured as deeply as it is today. As long as geologists recognized this terrace as a fragment of ancient valley floor, they inferred that the buried bedrock that underlies it dips to the west, just like all the other surfaces in the valley. However, because of the sediment deposited on top of the terrace and its imperceptible slope, there was never a way to verify this inference. Lacking verification, the most plausible interpretation was that it dips west and simply represents an older iteration of the Lower Wisconsin River than we see today. Yet the landscape contains clues that point to an alternate theory. Many of the tributaries of the Lower Wisconsin River angle to the east where they join this westward flowing river; these have long been known in the geologic literature as barbed tributaries, and they indicate a river that has experienced a significant upheaval. Too, the valley of the Lower Wisconsin River narrows as you follow it downstream, which is the opposite of what we see with almost every other river. Where it joins the Mississippi River at Prairie du Chien, the Wisconsin River curves to the north to join the south-flowing Mississippi; south of the confluence of the two rivers, the valley of the Mississippi River also narrows. These geologic clues suggest that the modern river system does not reflect the system that once flowed across this landscape. The westward-flowing Lower Wisconsin River may not be exactly what it appears at first glance, and the bedrock terrace contains the key to discerning what river systems looked like here millions of years ago. While tens to hundreds of feet of glacial till obscure most of the river’s older landscape, the Driftless Area has remained untouched (yet very much surrounded) by glaciers over the past 2.5 million years. The bedrock terrace, preserved within this time capsule of sorts, allows me to ask a fairly direct question of the earth: Was the original valley carved by a river flowing toward the west or toward the east? It’s a question as intriguing as it is unique, since in my experience it is rare that an important scientific question offers only two possible outcomes. As a geologist, I specialize in studying the processes and histories of rivers; more specifically, I study rivers that flow near the former margins of ancient glaciers. The idea that glacial activity may have caused the ancient Wisconsin River to flow to the east grew from many discussions I had with my former doctoral advisor, James C. Knox, before he passed away in 2012. Jim was the Evjue-Bascom professor emeritus of Geography at the University of Wisconsin–Madison and a pioneer in stream and soil research. Over the years, he and I tossed around hypotheses about the Wisconsin River that couldn’t be tested because of insufficient topographic data. In the early spring of 2013, however, improved topographic models, based on a new generation of laser-derived data called LiDAR, became available. Generated by measuring the two-way travel time of laser light shot from an airplane toward the ground, LiDAR data are accurate enough to identify ground surface elevations to within a few centimeters. Finally, we had a way to evaluate the elevation and slope of the ancient bedrock terraces. Scientific research is often collaborative, requiring multiple voices to provide a breadth of insight, experience, ideas, and skillsets. Posing and answering the question of whether the Lower Wisconsin River valley was carved by an eastward- or westward-flowing river was no exception. Several of my colleagues at the Wisconsin Geological and Natural History Survey—John Attig, Elmo Rawling, and Ben Bates—assisted with the LiDAR data interpretation and subsequent fieldwork. We began by taking a series of hydraulic core samples along the terrace, driving hollow steel rods down through the surface sediment to the bedrock terrace and describing the cores we collected to identify the depth at which we struck bedrock. We combined the LiDAR data, coring information, and core descriptions to precisely identify the elevation of the river-scoured bedrock terrace to within a few centimeters at a handful of points. Then we collected this information again and again at dozens of points along the valley to build enough data to identify the trend. Those several weeks of data collection stand out in my memory. The anticipation of answering the east-versus-west question lent a tension to the fieldwork that I had never experienced in all my years of research. As we collected cores kilometers apart and eventually tens of kilometers apart, I plotted each day’s new data to look for emerging trends. Within the first few days, I began to develop a broad sense of how deeply we should core at a given location depending on whether the bedrock terrace dipped to the east or to the west. While I wouldn’t normally anticipate a particular outcome from collecting research data, I was hoping we would identify that the terrace dipped to the east. The implications were tantalizing: A different configuration for the Lower Wisconsin River necessitates a different one for the upper Mississippi River, and for tributaries of the upper Mississippi River—the Black, Chippewa, Root, St. Croix, and Minnesota. Moreover, rivers flowing to the east across Wisconsin and Minnesota probably wouldn’t have reached the Gulf of Mexico. If this were true, it would prompt a reconsideration of the way we understand rivers across the North American continent. While I am by nature an early riser, I recall numerous sleepless nights in the summer of 2013, thinking about the emerging work and waiting for the alarm to sound for another day of coring. I would hope and, sometimes, even despair over the depth to which the core was penetrating, and obsess over the location and placement of new cores. My anxiety turned to excitement when I began to be able to predict the depth at which the core would strike bedrock if the terrace were indeed dipping to the east. When we moved to a site at the west end of the terrace near Muscoda, I estimated we’d need to strike bedrock no deeper than seven feet—which we did. The data all pointed to a valley that, while occupied today by a westward-flowing river, was actually carved by an ancient, eastward-flowing river. The months that followed were filled with marshaling additional evidence to support this new interpretation of the river. We pored over the data to look for holes or flaws in the interpretations and presented our results to colleagues in the field for their critical assessment of the work. Given our findings, my colleagues and I have developed a picture of a vast ancient river system that drained almost all of what is now Wisconsin and Minnesota. We have named it the ancestral Wyalusing River. The course of the Wyalusing River was certainly controlled by the local bedrock. Erosion-resistant layers of dolomite bedrock form topographic highs in the state. The east-west running Military Ridge in the southwest corner of Wisconsin, which is capped by one of these layers of dolomite, prevented these ancient rivers from flowing to the south. Instead, they flowed to the east. Fed by glaciers of an earlier era, these swift rivers cut deeply into the weakly cemented and easily erodible sandstone that underlies the dolomite and moved into the Great Lakes lowland and eventually to the Gulf of St. Lawrence and the North Atlantic Ocean. Perhaps a million or more years ago, encroaching glaciers blocked the Wyalusing River and dammed a vast lake in the river valley. The rising waters spilled over the dolomite ridge to carve a pathway to the south, flowing into a new valley between Prairie du Chien and Dubuque, Iowa, and continuing to the Gulf of Mexico. The new, shorter pathway to the oceans captured the rivers across Wisconsin and Minnesota and formed the upper Mississippi River system we know today. Glaciers caused the reorganization of these river systems, but the lack of glaciation in the Driftless Area left scattered fragments of ancient river valleys exposed at the surface rather than buried by glacial sediment. This was the window into the geologic past that allowed us to understand the legacy of the ancient rivers of Wisconsin and Minnesota. I see it every time I look at the Wisconsin River now. When I hike up to Ferry Bluff or drive across the river at Spring Green or Muscoda, I look at the river around me and see the water flowing to the west on its way to the Gulf of Mexico. But I also see the ancient Wyalusing River, its water flowing to the east and bound for the North Atlantic Ocean. Two rivers occupying the same space at different times. Eric C. Carson is a geologist with the Wisconsin Geological and Natural History Survey. He received his BS from West Virginia University and his MS and PhD from UW–Madison.